Air quality is important for maintaining the health and well-being of the population, with gasses such as nitrogen oxides, carbon monoxide gas, and the more commonly found carbon dioxide gas being some of the major causes of air pollution, collectively responsible for an estimated 527,700 yearly deaths in India and about 41,200 annually in the US. Deploying air quality monitoring wireless sensor networks is a step towards detecting the presence of such pollutants. However, the limited lifetime of the battery-powered monitoring network is a major concern. 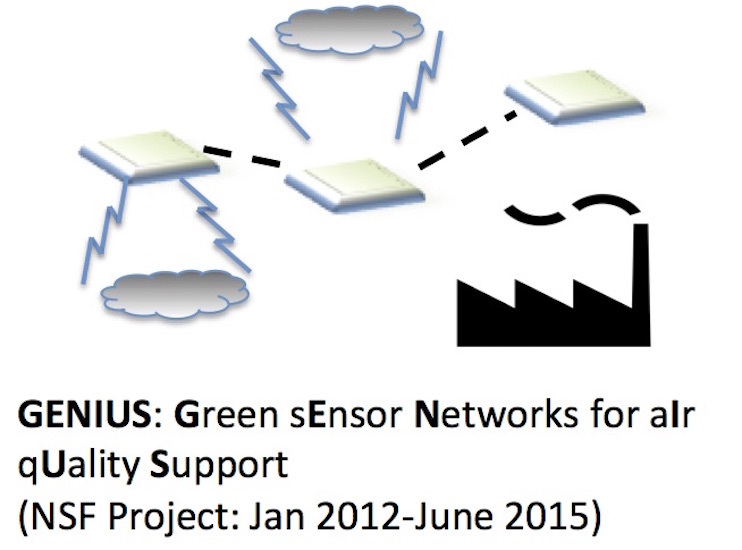 This project called GENIUS (Green sEnsor Networks for aIr qUality Support) proposes a new architecture comprised of sensor hardware, protocols, analytical models, and optimized implementation geared towards new self-sustaining sensor nodes. These sensors operate by harvesting energy from the environment, and they optimize energy usage through an on-demand wake-up radio technology, potentially leading to a perennial pollution-monitoring network. GENIUS is envisaged to play a key role in emergency warnings based on periodic data logging, and to contribute to the societal well being in densely populated and congested regions in both the US and India. The project team is composed of Northeastern University (NU, PIs Chowdhury and Basagni) and University of Rochester (UR, PI Heinzelman) in the US, along with Indian partners from IIT-Delhi (IITD, PI De) and IIT-Hyderabad (IITH, PI Jana). A key aspect of this project is to also facilitate international collaboration among participants in the US and India, with the exchange of technical results, research facilities, faculty and student exchanges, and shared implementation goals. M. Y. Naderi, K. R. Chowdhury, and S. Basagni, “Wireless Sensor Networks with RF Energy Harvesting: Energy Models and Analysis,” IEEE WCNC, accepted, New Orleans, LA, 2015. D. Mishra, S. De, S. Jana, S. Basagni, K. R. Chowdhury, and W. Heinzelman, “Smart RF Energy Harvesting Communications: Challenges and Opportunities,” IEEE Communications Magazine, accepted, 2014. M. Y. Naderi, K. R. Chowdhury, S. Basagni, W. Heinzelman, S. De, and S. Jana, “Experimental Study of Concurrent Data and Wireless Energy Transfer for Sensor Networks,” IEEE GLOBECOM, Austin, Tx, 2014. M. Y. Naderi, P. Nintanavongsa, and K. R. Chowdhury, "RF-MAC: A Medium Access Control Protocol for Re-chargeable Sensor Networks Powered by Wireless Energy Harvesting,” IEEE Transactions on Wireless Communication, vol. 13, no. 7, July 2014. M. Y. Naderi, K. R. Chowdhury, S. Basagni, W. Heinzelman, S. De, and S. Jana, “Surviving Wireless Energy Interference in RF-harvesting Sensor Networks: An Empirical Study,” IEEE SECON Workshop on Energy Harvesting Communications, Singapore, June 2014. P. Nintanavongsa, M. Y. Naderi, and K. R. Chowdhury, "A Dual-band Wireless Energy Transfer Protocol for Heterogeneous Sensor Networks Powered by RF Energy Harvesting," IEEE Intl. Computer Science and Engineering Conference (ISCEC), Bangkok, Thailand, September 2013. P. Nintanavongsa, M. Y. Naderi, and K. R. Chowdhury, " Medium Access Control Protocol Design for Sensors Powered by Wireless Energy Transfer," Proc. of IEEE INFOCOM mini-conference, Turin, Italy, April 2013. P. Nintanavongsa, R. Doost-Mohammady, M. DiFelice, and K. R. Chowdhury, "Device Characterization and Cross-layer Protocol Design for RF Energy Harvesting Sensors," Elsevier Pervasive and Mobile Computing Journal, vol. 9, no. 1, pp. 120-131, February 2013. A. H. Coarasa, P. Nintanavongsa, S. Sanyal, and K. R. Chowdhury, "Impact of Mobile Transmitter Sources on Radio Frequency Wireless Energy Harvesting," in Proc. of IEEE Intl. Conference on Computing, Networking and Communications (ICNC), San Diego, California, January 2013. M. Y. Naderi, S. Basagni, and K. R. Chowdhury, “Modeling the Residual Energy and Lifetime of Energy Harvesting Sensor Nodes”, in Proc. of IEEE GLOBECOM, Anaheim, California, USA, December, 2012. * Only publications co-authored by Prof. Chowdhury are listed above.